When the economic crisis began to unfold last year many people said that it wouldn’t affect the world of wine — people will still want to drink, they said, even more so when they are worried or depressed. Recession is good for wine, they assured us. Well, we all know now that that line of reasoning was misguided. The crisis is hitting almost every shelf on the Wine Wall as consumers cut back and trade down (only a few value brands like Barefoot Cellars seem to be benefiting). The most recent issues of Wine Spectator and Decanter feature cover stories that are designed to appeal to recession-shocked bargain-hunting wine enthusiasts. (See note below.) Wine industry publications are packed full of stories about how producers, retailers and restaurants are coping with declining demand. Now that we know that economic crisis is having a real impact on wine, it is time to think more seriously about what form that impact is taking. Most people that I have talked to are thinking in terms of boom-bust cycles. The current downturn will be very difficult — and a shake out will take place across the industry — but, they say, the wine economy will bounce back again once the economy itself starts to recover. This is probably the correct way to think about the future of wine markets, but it isn’t the only way. A second possibility is that the crisis will produce a long term structural change in the wine market. The market won’t bounce back from its low, but rather will reset itself and proceed along a new and possibly unpredictable future path. Economists who study other sectors (finance, automobiles, agriculture) and taking the possibility of structural shifts seriously. Could it be happening in the world of wine? I have given a lot of thought to question of cycles and shifts over the years. 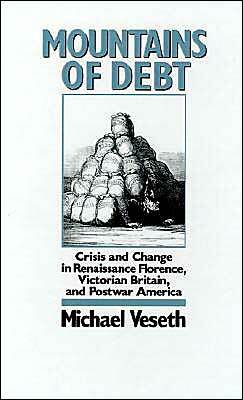 My best known work in this regard is a comparative economic history of public debt in advanced economies called Mountains of Debt: Crisis and Change in Renaissance Florence, Victorian Britain and Postwar America (Oxford University Press, 1990). (Mountains went out of print in the Clinton years when the US deficit went away, but George W. Bush and the current crisis convinced the publisher to bring it back). One point of the book is that some crises are more significant than others. Sometimes a crisis is a tremor that shakes things up for a while but leaves the landscape pretty much unchanged. Other crises are major earthquakes, with more lasting long term implications. Maybe this is a “Big One,” at least in terms of wine. I’m going to use the next few blog posts to think through this important question. One early indicator of structural change comes from London, the center of the wine world. Great Britain, as I’ve said before, is the most important wine market in the world. The British don’t drink the most wine in the world or produce the most, either, but they buy a lot of wine from other countries, making them the largest import market and therefore the focus of international competition (Germany and the United States along with Britain form the Big Three import markets). But this may be changing. Britain’s economy is being badly battered by the economic crisis, as an article in yesterday’s Financial Times makes clear. As the UK economy contracts at its fastest rate since the second world war, the … Industry Watch report predicts that more company casualties will follow in 2010. It says 39,000 businesses, or one in 50, are likely to fail next year. Britain’s banking sector is in bad shape, perhaps even worse than the US industry, and its government budget deficit is also spiraling into the red. This has general wine market effects similar to those in the US (cutting back, trading down, switching over), but some different ones, as well, the most important of which is due to the exchange rate. As Britain’s economy has imploded the pound has collapsed as well. The pound has fallen by about 25% against both the dollar and the Euro. It took about $2 (or €1.30) to buy a pound a year ago, now it is selling for $1.45 (or €1.06) today. This means that imported wine (which in Britain is, well, wine) costs much more because of the exchange rate at the same time that the slumping economy (and lowered expectations) are undermining demand. The US dollar, on the other hand, has appreciated relative to most currencies apart from the yen, promising wine buyers lower prices to match their reduced economic circumstances. So the recession is affecting wine in Britain more than the US wine market. A shift is taking place — is it temporary or will it be permanent? Although it is too soon to know for sure, I think it is possible that these factors could cause London to lose its preeminent position in the world wine market. I see indicators in the decline of the Australian industry (complicated by other factors, I know — but the collapse of the British market is part of it) and the recent global focus on Argentina and its excellent wine values (both Wine Spectator and Decanter make this point). Although Argentinean producers are looking to export wherever they can get a foot in the door, my strong sense is that they see their future in the U.S. market more than Great Britain. Perhaps they are at the head of the pack as the world wine market resets and proceeds on a different path.